The study gives the Old and New Testaments equal time, emphasizing the wholeness of the Bible as a revelation of God. DISCIPLE draws upon the work of scholars, the personal Bible reading and study of the participant, and dynamic group discussion to aid understanding of the Bible. 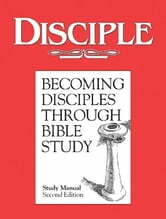 The first study in the program is DISCIPLE: BECOMING DISCIPLES THROUGH BIBLE STUDY, a thirty-four week overview of the entire Bible. Three and one-half to four hours of independent study each week (40 minutes daily for leaders and 30 minutes daily for group members) in preparation for weekly group meetings. Attendance at weekly 2.5 hour meetings. Each member of the group needs a study manual and a Bible. The Bible is the text for the study and the study manual will guide group members in their study and preparation for the weekly group session. The study manual also includes suggestions for individual and study-related activities. Space is provided for taking notes while reading Scripture, for recording thoughts and questions arising out of daily study, and for notes during the weekly group session. The titles of the sessions along with theme words and theme verses, and major persons, events, and topics will set the sequence of the biblical story in the minds of the participants. The principal Scripture for each session follows the chronological movement of the biblical story. Heaven is for Real – A Young Girl’s Amazing Trip to Heaven and Back.